This whitepaper summarises those provisions of the Regulatory Reform (Fire Safety) Order 2005: SSI No. 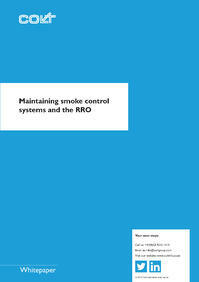 1541 (“RRO”) that relate to smoke control systems. Effective maintenance is a key factor in ensuring that safety critical equipment such as smoke control systems will operate faultlessly when needed. It is backed up by the provisions of the Regulatory Reform (Fire Safety) Order 2005, which are not always fully understood. The RRO affects every business, no matter how big or small. Many local authority Fire Brigades no longer offer free goodwill advice, taking the view that the rules are set out in British Standards and Codes of Practice and are available to all. However, the rules are open to interpretation and owner or occupier has to look elsewhere for guidelines and advice on meeting the legal standards in a cost effective way. Please fill in the form below to download the whitepaper.